Ah, Spring. It’s the time of new life, of warmer days and, hopefully, of relaxation. With such pleasant weather, many start looking at taking some time off for a holiday. For some, this holiday will entail the classic road trip. But before you jump in your car and hit the road, it’s important to remember some essentials. These are often the types of essentials that truck drivers ensure they have before making tracks, and they’re certainly worth having for any type of road travel. When you’re going on a trip to roads previously untravelled, then you’re going to want a GPS and a map. When we say you need both of these, we mean it. Yes, GPS is the modern solution – whether it’s a devoted GPS or the one on your smartphone. However, if your new newer digital navigator either happens to fail or starts sending you in circles, then consulting a traditional map gives you the power to map out a more logical route. It’s just lucky that GPS devices are getting smarter and more adaptive now. If you were to hit the road without any food or water, you’d be putting yourself in a pretty unpleasant situation. There may be plenty of places to get food and drink from along the way, but you also need snacks and proper food (e.g. sandwiches) to work off in the interim. Of all the fluids to take with you, make sure you go with water. Hydration is important, especially when the Spring sun is coming through your windows. The most important reason for having your own supply? If you happen to find yourself stranded in the middle of nowhere with car troubles, you’re going to need that food and water to see you through until help arrives. Vehicles break down – it’s the reality of dealing with machinery. While it may not be the most likely scenario to happen, it’s still one of those things that doesn’t discriminate – of course, if your vehicle is already in bad shape before you head off, then you’re simply putting yourself at risk from the get-go. But if your vehicle does break down, you’ll want to have the necessities covered – such as an extra tyre/s, jumper cables, a means of calling for help, and so on. If possible, even map out where mobile phone dead spots are so that you know where you’re most at risk to be stuck if you get, well, stuck. In this day and age, you need this for a road trip. Smart phones don’t exactly have the same week-plus life of older mobile phones, so their battery runs out fast. While some smart phones do come with robust power saving features, most still won’t last too long unless you simply stop using them. Given your mobile phone is essential to calling emergency services if you end up stranded or in a potentially life threatening situation, you need to keep it well charged at all times. Air conditioning may cause your vehicle to eat through its fuel more quickly, but it is worth using from time to time. If you prefer the wind against your skin, then that’s perfectly fine. However, when temperatures are getting either very high or very low (possible in desert areas during Spring), you may need to better control your environment for the sake of your health and comfort. When using air conditioning, don’t forget that it does sap the moisture from the air. This will bring on dehydration just like excessive sweating can. So make sure to keep your fluids up, as well. If your air conditioning doesn’t currently work 100%, then you should have it repaired before heading off on your trip. Last but not least, don’t forget to have money on you – and we mean actual physical money. We may live in a world where you can now basically pay for everything with your debit or credit cards (and even via NFC with select smart phones), but some places may still be cash only. Even if this isn’t the case, having cash on your person is still a good idea – particularly if you damage or lose your card. 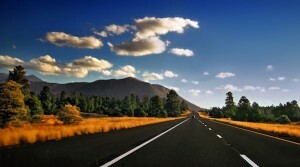 “I-40 west near Flagstaff” by Nicholas from Pennsylvania, USA – Environs. Licensed under CC BY 2.0 via Wikimedia Commons.